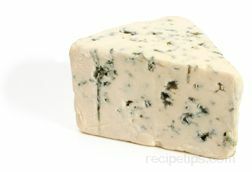 Originating in Sweden, this variety of blue cheese is produced much like the well known Bleu d'Augverne cheese. Adelost Blue Cheese is made from cow's milk and is characterized by streaks of dull blue mold that runs throughout this moist and creamy blue cheese. After being processed, this cheese is formed into drum shapes cylinders weighing approximately 5 to 6 pounds (2 to 3 kg). Encased in a natural rind dusted with molds, Adelost cheese provides a sharp, tangy flavor that makes it excellent as an addition to salads, for snacking or for serving as a dessert cheese.